Sojourner is visible in this color image, one of the first taken by the deployed Imager for Mars Pathfinder (IMP) on Sol 3. The rover has moved from this position into one that later facilitated its using the Alpha Proton X-Ray Spectrometer (APXS) instrument on Barnacle Bill. The APXS, located at the rear of the rover, is not visible in this image. 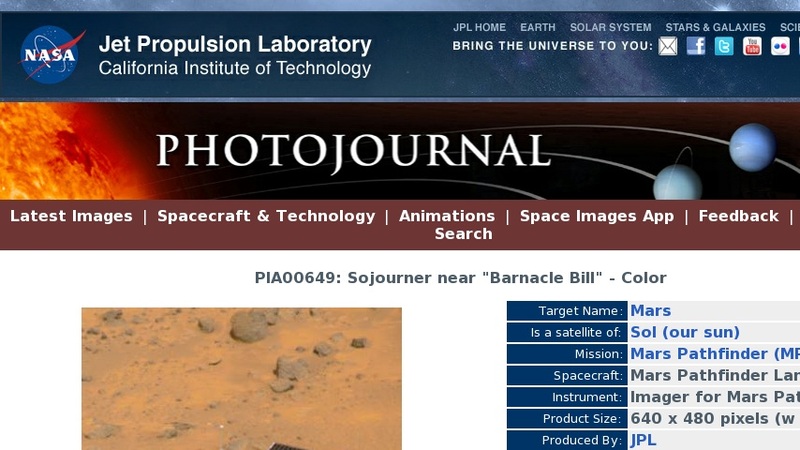 The image was taken by the Imager for Mars Pathfinder (IMP) after its deployment on Sol 3. Mars Pathfinder was developed and managed by the Jet Propulsion Laboratory (JPL) for the National Aeronautics and Space Administration. JPL is an operating division of the California Institute of Technology (Caltech). The IMP was developed by the University of Arizona Lunar and Planetary Laboratory under contract to JPL. Peter Smith is the Principal Investigator.